Leader of La Vuelta 2017, Chris Froome (Team Sky) made the most of stage 9's steep finish to claim the victory at La Cumbre del Sol. 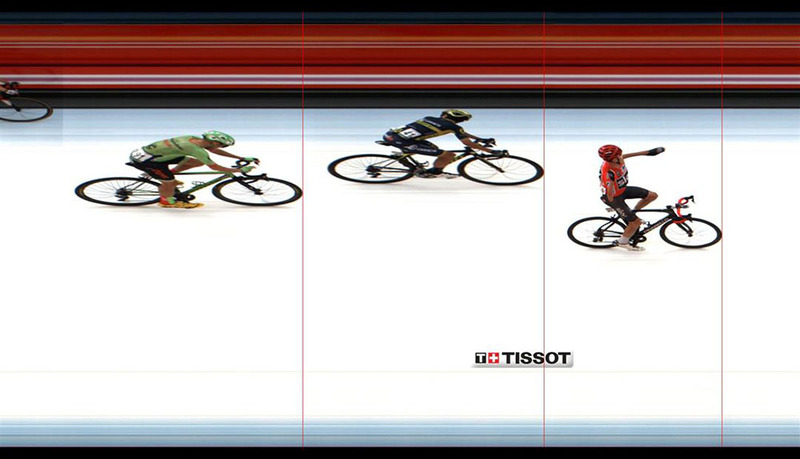 The winner of the Tour de France took the win ahead of Esteban Chaves (Orica-Scott), who now trails by 36s on GC, and Michael Woods (Cannondale-Drapac). 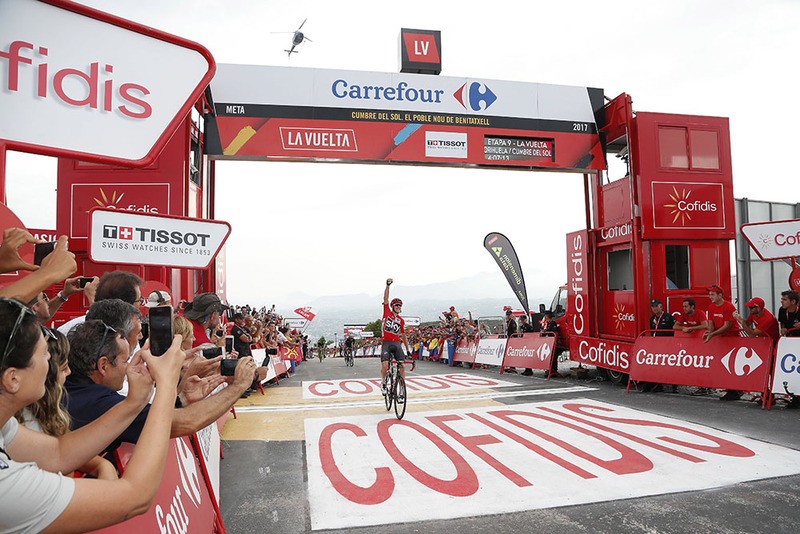 This is Froome's fourth stage victory at La Vuelta. The day also saw Kris Boeckmans come back to La Vuelta two years after his terrible accident.. It took 20km of hard racing for 10 of the 181 riders still in the race to build a one minute lead over the peloton. Markel Irizar (Trek-Segafredo), Marc Soler (Movistar), Marco Haller (Katusha-Alpecin), Bert-Jan Lindeman (LottoNL-Jumbo), Tobias Ludvigsson (FDJ), Anthony Turgis (Cofidis), Lluis Mas and Diego Rubio (Caja Rural-Seguros RGA), Conor Dunne (Aqua Blue Sport) and Ricardo Vilela (Manzana Postobon) then spend most of the day at the front. It was Cannondale-Drapac that took control of the peloton ensuring the gap got no higher than 3 minutes. Marc Soler (Movistar) and Tobias Ludvigsson (FDJ) lead over the first climb up the alto de Puig Llorença shedding the of the rest of their breakaway companions. 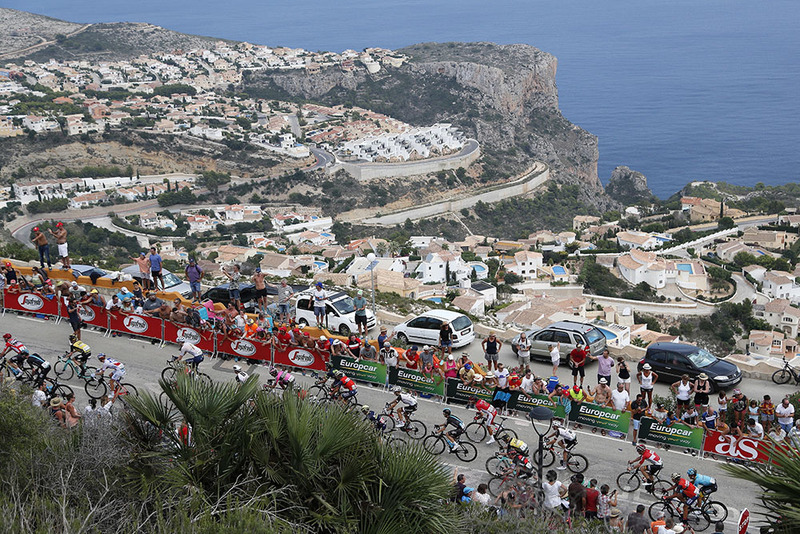 At the top, the Cannondale-led peloton was only 1:50 behind them. The stragglers were swallowed on the downhill and the gap with the leaders went down to 1 minute as the race entered the last 25km. The leading duo was finally caught with 6km to go and Team Sky took matters into their own hands. Mikel Nieve (Team Sky) controlled attacks from Romain Bardet (AG2R-La Mondiale) and Richard Carapaz (Movistar) in the last climb. Then his leader Chris Froome (Team Sky) accelerated with 500m to go and held off Esteban Chaves (Orica-Scott) to tighten his grip on the red jersey on the eve of the rest day. 5 Ilnur Zakarin (Rus) Katusha-Alpecin s.t. 8 Sam Oomen (Ned) Team Sunweb both s.t. 10 Vincenzo Nibali (Ita) Bahrain-Merida s.t. 13 Miguel Angel Lopez Moreno (Col) Astana Pro Team s.t. 16 Adam Yates (GBr) Orica-Scott s.t. 20 Louis Meintjes (RSA) UAE Team Emirates s.t. 25 Franco Pellizotti (Ita) Bahrain-Merida both s.t. 29 Jhon Darwin Atapuma Hurtado (Col) UAE Team Emirates s.t. 37 Peter Stetina (USA) Trek-Segafredo s.t. 42 Jesus Alberto Hernandez Blazquez (Esp) Trek-Segafredo s.t. 46 Bart De Clercq (Bel) Lotto Soudal s.t. 50 Enric Mas (Esp) Quick-Step Floors s.t. 54 Koen Bouwman (Ned) Team LottoNL-Jumbo both s.t. 56 Gianni Moscon (Ita) Team Sky s.t. 58 Alexandre Geniez (Fra) AG2R La Mondiale s.t. 60 Serge Pauwels (Bel) Dimension Data s.t. 65 Matej Mohoric (Slo) UAE Team Emirates both s.t. 70 Aldemar Reyes Oretesa (Col) Manzana Postobon all s.t. 73 Kilian Frankiny (Sui) BMC Racing Team s.t. 76 Emanuel Buchmann (Ger) Bora-Hansgrohe both s.t. 81 Maxim Belkov (Rus) Katusha-Alpecin s.t. 84 Francisco Jose Ventoso Alberdi (Esp) BMC Racing Team s.t. 99 Chad Haga (USA) Team Sunweb all s.t. 103 Bert-Jan Lindeman (Ned) Team LottoNL-Jumbo both s.t. 111 Carlos Verona (Esp) Orica-Scott all s.t. 113 Simon Clarke (Aus) Cannondale-Drapac s.t. 117 Diego RubionHERnandez (Esp) Caja Rural-Seguros RGA s.t. 140 Jacques Janse van Rensburg (RSA) Dimension Data all s.t. 152 Ivan Garcia Cortina (Esp) Bahrain-Merida all s.t. 163 Conor Dunne (Irl) Aqua Blue Sport all s.t. 165 Davide Villella (Ita) Cannondale-Drapac s.t. 168 Daniel Oss (Ita) BMC Racing Team s.t. 175 Michael Schwarzmann (Ger) Bora-Hansgrohe all s.t. 177 Jelle Wallays (Bel) Lotto Soudal s.t. 179 Toms Skujins (Lat) Cannondale-Drapac s.t.